321Soft Screen Video Recorder - How to Start Recording Screen into Video? How to Start Recording Screen into Video? 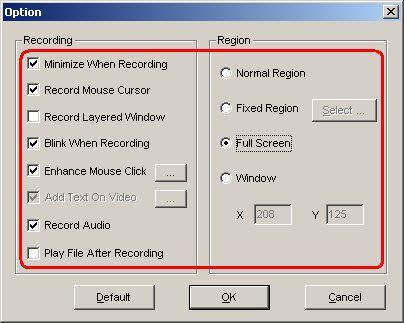 Launch the software 321Soft Screen Video Recorder, and click the pull-down menu "File > Enter File Name to Save Recording..."
Click the pull-down menu "Options > Hotkey..." to change hotkeys if you want. 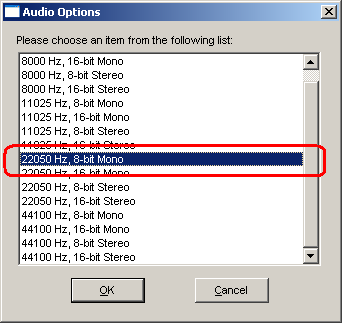 You will see the below hot keys dialog, that you can change the hot keys for start or stop recording. Press hot key of start recording to start recording, or click the pull-down menu "Record > Start" to start recording. Press hot key of stop recording to stop recording, or click the pull-down menu "Record > Stop" to stop recording. Click the pull-down menu "Record > Play..." to start playing the recorded video with the default player available on your computer. 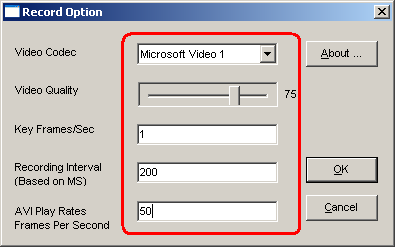 Click the minimize button on the 321Soft Screen Video Recorder to hide the main window, click the icon docked in the system tray to show it again. 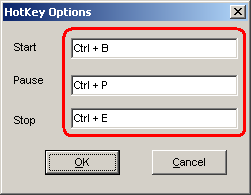 You may also press short-cut keys or click the toolbar buttons instead of clicking the pull-down menu!